Every moment is included in this must-have bundle. The original Crysis continues with the Crysis Warhead expansion, and the Crysis 3 action keeps coming in the Lost Island DLC. 10 quid for the games. 2000 quid to run them. Hot! Especially as Crysis 3 used to tax the turnip outta my i5 2500 & R9 390x combo! I rarely crank up my watercooled radiator fans for games but needed too for this game, it heats up my card and cpu a lot compared to other games getting around 95 - 100 fps on tweaked high/very high settings at 1440p on a 1080 GTX. 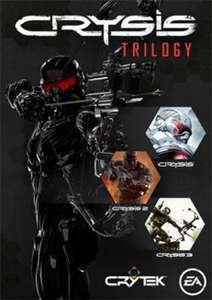 Should be called, "Crysis Trilogy, can your machine handle it?" 10 quid for the games. 2000 quid to run them.